When it comes to character collection, Final Fantasy VI serves as a grand example of why less is more. Last week when I wrote about Suikoden II, probably my biggest complaint was that the game, despite boasting an epic cast, didn't leave me feeling like I'd encountered many great characters. Some of this might be that I just didn't connect with the game the same way that others did. I'll also admit that I could have missed a thing here and there during my playthrough. It's a big game and it was my first time with it. Maybe when I get to a second run at some distant point in the future, I'll notice a whole bunch of details I missed the first time and my opinion will completely change. My current sense of it though, is that fully fleshing out every one of its 108 recruit-able characters wasn't really one of the developers concern. Which is fine, of course. Suikoden II perhaps doesn't do the best job of turning all of its characters into memorable individuals, but it uses them to give the player a tangible way to gauge their progress and the growth of their army. They actually almost reminded of the war assets in Mass Effect 3, in a way. My problem is that deep down I'm personally not much of a collector. Story is often the biggest driving force for me in an RPG, and when a game includes a heavy collection element, it's not uncommon for me to reach a point where I stop caring and simply want to push forward with the plot. Despite knowing that the best ending to Suikoden II requires the player to collect all 108 of its characters, I eventually got tired of tracking them down and resigned myself to a lesser ending. Even though the collectibles were people, I didn't find them interesting enough to invest the full effort they demanded. Which brings me to Final Fantasy VI. While the bulk of that game is a purely linear JRPG fantasy romp, its ending section (the World of Ruin) involves a lengthy stretch where your main activity is finding and reconnecting with your lost party members. It's not entirely the same as Suikoden II, but it's also, in my opinion, a superior version of the same idea. Its greatest strength is probably how limited it is. Final Fantasy VI's cast, excluding secret characters, only has 12 members as opposed to Suikoden II's 100-plus. I don't think I should have to explain how it's easier to craft memorable characters when you're only dealing with a dozen rather than a hundred or more. The section where you're tasked with tracking them all down is also somewhat small in the grand scheme of the game. You'll play through a good 30 hours of story before you get there and, if you're just looking to complete the plot, you could probably plow through it in another 10-15. It's nowhere as large a component as character collection in the Suikoden games. That being the case, I'd still posit that the collection experience in FFVI is much more meaningful than what other games accomplish. A lot of this, for me at least, stems from the fact that game's plot is, more than anything, a mish-mash of character pieces. The story has a good hook, but it's very much still a simple "plucky rebels vs. evil empire" tale. It uses this simplicity however, as a foundation to tell some of the best characters dramas in the entire JRPG genre. Cyan's story of tragedy and loss never ceases to be heartbreaking. Shadow's dream sequence back story gets me every time. And the relationship between Celes and Locke? 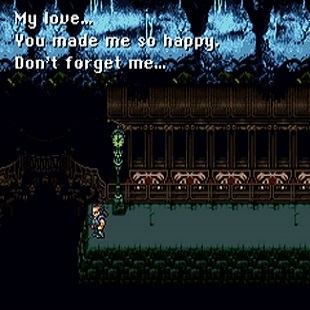 Even today I'd put it up as one of the most beautifully subtle romances video game's have ever produced. What I especially love, in turn, is how it connects character collection to the advancement of the cast's personal plots. When you reach the World of Ruin, it's perfectly possible to head into the final dungeon and take on the game's big bad without finding everyone. After spending dozens of hours with these characters though, you'll likely be too invested in their trials and tribulations to leave anyone behind. I've personally completed Final Fantasy VI five (or is it six?) times and I've been willing to finish the game without first retrieving all of my pixilated friends. Add in the fact that finding them opens new side quests connected to their stories and you're given some excellent reasons to put in the work and track all of your allies down. In the end why, the reason I think I didn't connect with Suikoden II on a similar level is that it never triggered that same sense of incentive in me. Despite its best efforts, very few of the characters exhibit personalities or stories anywhere near as interesting as its 16-bit genre predecessor. Being a story driven gamer, the rewards it offered me for recruiting its army of characters weren't as enticing as simply progressing the plot. In the end, it just felt too much like a numbers game to me. "If you collect this many characters we'll give you this cool thing!" Some might like that, but the sort of collection I'm interested is the kind that feels like its own reward. There are other games, of course, that use character recruitment to similar effect. The Fire Emblem games, overall, strike a really solid balance between having a larger cast and having good characters. Other recent titles like Mass Effect 2 also do a fantastic job of coupling character collection with interesting plot. 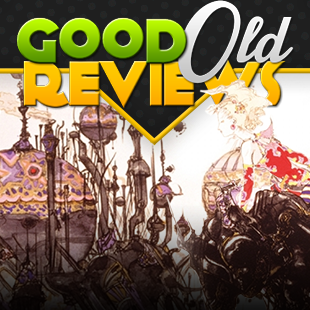 For me though, Final Fantasy VI will always be the great classic exemplar for me. Granted, it's also my favorite video game, so I might be a bit biased. That said, I can't think of another title that does a better job of making you fall in love with its cast before throwing them to the wind and telling you to go fetch. Next week we're going to tackle some of more of the newly Star Wars games with Marshall Lemon's review of Star Wars: Galactic Battlegrounds!